If you would like them (in raw PPT form), please email me dnickull at adobe dot com. I will be in Tenerife for a two week vacation until December 1, so it may be a while. Does Apple own Web 2.0? 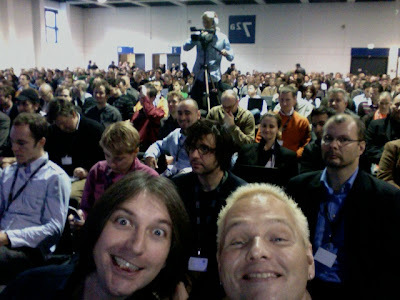 This is the front row of the Web 2.0 Expo in Berlin. My seat was about 7 to the left of Tim O'Reilly although I put my MacBook Pro down to take this photo. Tim says to follow the alpha geeks. I wonder how the Microsoft speaker felt as he looked down on this row five minutes earlier. I think it is time to go buy some shares in Apple! You are free to download these and use them to explain Web 2.0 to others. 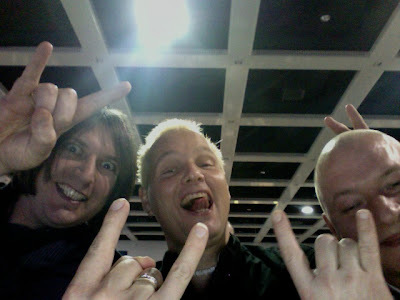 You mean rock horns like this? True devotion starts with ink! 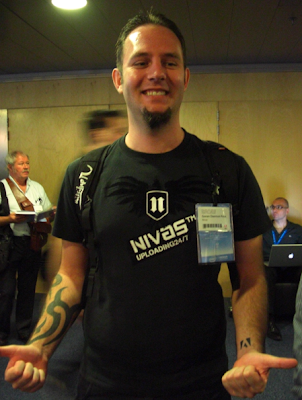 During Adobe MAX EMEA in Barcelona, I met several people who are fans of Adobe. None beat this guy – he actually has a real (not temporary) Adobe tattoo on his lower left wrist. Having watched most of Tim O’Reilly’s keynote talk (yesterday) here at Web 2.0 Berlin, I had an epiphany ( I missed part of it to provide due ubersetzung (translation) between panicked O’Reilly staff and the sole German only speaking tech guy on duty for the keynotes). Tim really espoused that one of the core patterns of Web 2.0 is harnessing collective intelligence. This is a pattern whereby you collect the intelligence from many individuals and mash it up to create something new (product, website, platform, or whatever), based on the collective and collaborative best ideas and scrutinizing by all involved. So why does Tim get this? He didn’t invent the concept of developing things by committee and is far from being the only one who uses it. So why did he seem to be the first one to really understand it and explain it well? The answer is actually so simple it escaped me until now. O’Reilly Media, as a publisher, has been using this pattern for years. It is implemented by making, refining and publishing books. When O’Reilly makes a new book, they use the collective intelligence of multiple authors, editors, technical reviewers and others who help package, market and promote a book. It is a textbook example of this pattern in action. Their collective intelligence makes O’Reilly books better than most others. Design and Architectural patterns are really the basis for Web 2.0 in terms of defining it and distinguishing it from the first iteration of the Internet. During the general keynote sessions, many speakers correctly noted that patterns can be reapplied to other realms. You could use the same pattern (harnessing collective intelligence) for building a house, a formula one car or software. Getting collaborative input provides more ideas from which to select the final design and form. 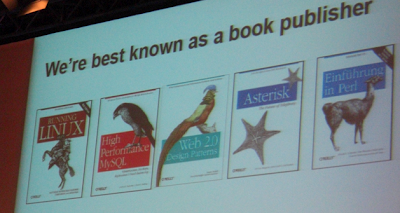 The new O’Reilly book "Web 2.0 Design Patterns" discusses some of the key patterns, although it does not claim to be a complete or authoritative resource in terms of what Web 2.0 is. It was written for people seeking to understand what Web 2.0 is all about and the impact it is having on their industry. As a book publishing company, O'Reilly has used this pattern in their design since first developing their process. This process is completely different from one in which a book is made in secret and released only when deemed ready. 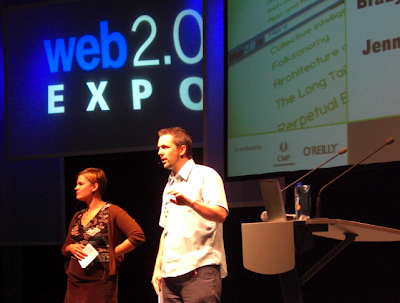 Some other Day 2 observations for Web 2.0 Expo Berlin? Brady Forrest and Jen Pahlka are working very hard to make this event great. It is no small feat and considering the diversity of attendees, they have done a stellar job. IMO, deserving of huge raises and toasts with good German beer. During the keynote session, there seemed to be a ghost in the room randomly advancing the slide deck to trip up Jen who handled it like a pro. Web 2.0 Berlin: Day One! Heute ist eine andere gutes TAG! Hier habe ich Tim Oreilly im Hauptkonferenzplatz getroffen! Tim bereitet seinen Hauptgededanken vor (auf einem Mac) wie ich diesen blog Pfosten schreibe. 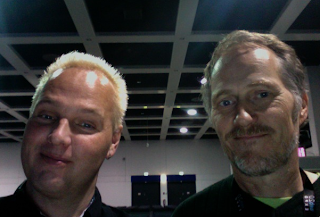 Duane Nickull and Tim O'Reilly in Berlin today. While I have been here for a week or so, today is the first day of real excitement. I had the luxury of sitting down with a very brilliant television crew (HdM Stuttgart | www.web2null-derfilm.de) crew to discuss some of the finer points of Web 2.0 from a European perspective. One of the questions was about how the Web 2.0 market in Germany might differ from the Web 2.0 market in the USA. I really have to respond that the very question itself is not correct. There is now a global marketplace and things that can affect people in one place are really affecting us all. The illusion that we are different is a relic of the non-digital age and the new electronic democracy can affect an entire generation, country, or multiple countries and generations with the same speed. Honestly, I think this may be one of the finest inteviews I have ever had the pleasure of doing. The questions were right on target and it really made me aware of some key questions from a European perspective. It seems, like in many other places, there is a real pragmatic struggle to understand *exactly* WHAT Web 2.0 is. Once again, I think the book Web 2.0 Design Patterns (co-authored with Dion Hinchcliffe and James Governor) is a good starting point, yet this book will leave readers with just as many questions as answers. I found myself digging up several of the core Web 2.0 patterns several times during the interview and keep realizing that it is hard to describe something when you abstract the implementation away from the facts. Nevertheless, the book really does this. And speaking of Dion, he is downstairs at his finest delivering his Web 2.0 University talk to an eager and packed audience. This is a great conference! Looking forward to some good German beer next! Industry analysts are generally favorable to the announcement, but say Microsoft is late getting to the table, and may have a tough time competing with vendors already well-established in the SOA space. "SOA is not equal to Web services. It is possible to use web service protocols without a service oriented architecture and it is likewise possible to develop an infrastructure using web services standards without it being SOA". For this revelation alone, Chris should be hailed as a great source of truth. I hope that Joe will take a close look at some of the work from the OASIS SOA RM TC and make a really pragmatic interview from someone in Redmond and ask them the tough questions (Don't ask Chris - he is smart and will have the right answers). I'd like to see Joe ask the marketing guys from Microsoft and report on that. hehehehe..yeah - I am feeling rather disruptive today!!! Sorry Joe! After years of not being recognized for having a full featured enterprise server story, Adobe has finally received great recognition from Infoworld's Test Center. In fact, reviewer Mike Heck rated LiveCycle ES an overall score of “very good 8.2” out of 10: with ease of use and scalability rated at 9.0; features, integration, and administration rated at 8.0. This doesn't surprise me as Mike is a well-known guy and has been very pragmatic in his past analysis of enterprise software. If you take a look at the kind of depth he goes into when testing Attensa Feed Server 1.1.7, you can easily see he isn't a writer for hire. He is pragmatic and speaks the truth about both good and bad aspects of software as he explores and experiences it. In other tests, he actually points out both weakness as well as strengths of Adobe Software.